International Center For Chemical And Biological Science (ICCBS) Karachi Sindh. Candidates should have PhD degree in Chemistry from HEC recognized University/Institution with at least 1 year of postdoctoral teaching/research experience in the field of synthesis of nanoparticles for drug delivery, and four research publications in internationally abstracted impact factor journals in a relevant field. 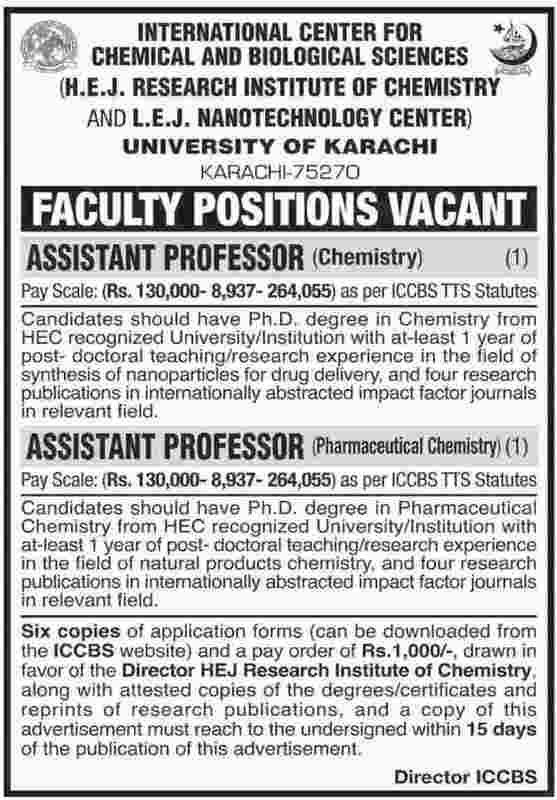 Candidates should have PhD degree in Pharmaceutical Chemistry from HEC recognized University/Institution with at least 1 year of postdoctoral teaching/research experience in the field of natural products chemistry, and four research publications in internationally abstracted impact factor journals in a relevant field. Six copies of application forms (can be downloaded from the ICCBS website) www.iccbs.org and a pay order of Rs.1,000 draft in favour of the Director HEJ Research Institute of Chemistry. along with attested copies of the degrees/certificates and reprints of research publications, and a copy of this advertisement must reach the undersigned within 15 days of the publication of this advertisement.